Use an intelligent licence plate recognition for the access control of your parking lot and infrastructures. With LPR / ANPR technology upgrade your security. Remote control from a distant computer or your smartphone with IP network connexion. Access control become connected, more secure and easier to use. For securing a small parking lot or multi site management our solutions can fit to your security needs. Managing lists of authorized vehicles to grant physical access to your building to have identification automation. Easy to install access control solutions to implement your portal security management. ANPR technology for safety & reliability. Compatible with our CCTV management system, alarm solutions, … For a better integrated security. Ready for use or custom made, contact us to find the one that meets your needs. 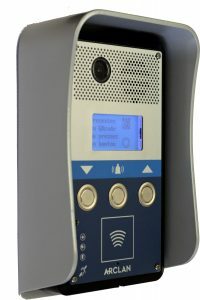 Videophone for access control, ARCLAN’s IPortier is an IP video intercom designed for remote controling your accesses via the IP network. Designed for public buildings and visitor management, the IPortier integrates a magnetic induction current loop for disabled persons. SIP protocol included allows to transfer video, sound, text messages or e-mail to the connected devices. With IP interface you receive your calls or your IP phone or your smartphone wherever you are. Compatible with Wireless solutions in your buildings. Memory included to check visits when you are away. Our intercom is designed and made in France. NetIO-COD is part of the ARCLAN access control range. It can be used independently from other devices for your access control. Pre register up to 100 codes in its memory or use it with your supervision software to control your accesses and upgrade your security system with its simple configuration. Integrate it as a simple module to secure your perimeter. 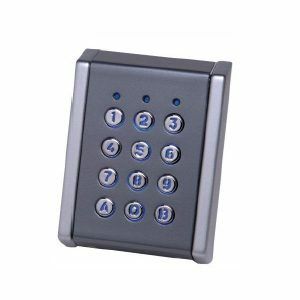 With its illuminated keypad use it easily night and day. Fonctionnement : stand-alone mode, IP network management with web server integrated. Codes : Permanent codes, limited duration codes, one use codes or duress codes for more security. Keyboard : backlist / Metal or plastic keys. NetIO Access operate independently with RFID proximity readers & keyboards from STID brand. Accesses are granted with a code, a card or both simultaneously for more security. It’s an open access control system that can easily be integrated in an IP security network solution. NetIO Access can store up to 600 cads or codes in its stand-alone mode. NetIO Access operate without PC, it is fast and easy to setup from its web interface. It’s also designed and made in France. Operation : Stand-alone mode administered by web browser. Right of access : Permanent & temporary. RFID reader & keyboards from STID. For compatibility with other brands, please contact us. © 2017 ARCLAN. ALL RIGHTS RESERVED.